Kagero is a publisher based in Lublin, Poland. They do their books in both Polish and English. This book is all in English. The book comes in a self-sealing clear cello bag. It is soft-cover of 20 pages in 8 1/4" x 11 3/4" page format. The cover art shows 2 Fw-190A's in color posed against a dark green background with a white line drawing of the top of the Fw-190A. The top one is overall white with a black spinal on the spinner, 2 blue fuselage bands, a skeletal black cross and a blue 7. It is a Fw-190A-9 (Sturm) of /JG300, Lobnitz, Germany, March 1945. This profile repeated on page 12 inside the book. The bottom one is in a splinter of 2 greens, over grey sides and a light-blue undercarriage. It has a black and white spiral on the spinner and white front on the cowling. Fuse code is white 12 + circle outlined in black. It is a Fw-190A-3, flown by Fw. Ernst Mayer of 9/JG5, Herdla, Norway, late March 1945. Profile is repeated again on page 8 inside the book. 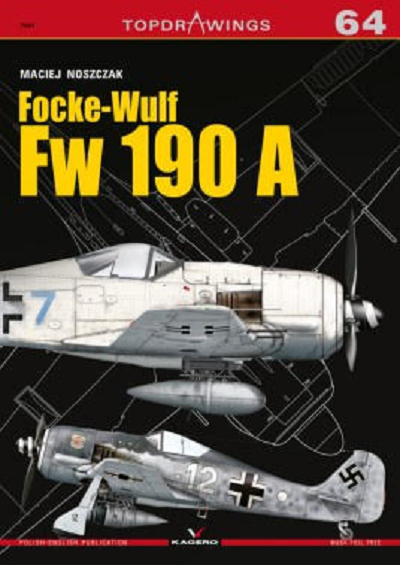 The book contains 12 color illustrations (including the front and back covers) and 80 line drawings of Fw-190A's. There is a bonus inserted loose in the book of canopy masking designed for either the 1/72nd or 1/48th scale kits by Tamiya of the Fw-190A. Being die cut into a jet black sheet the parts don't photograph to see the sections. There is a large sheet inserted in the book that is 17" x 11" folded in the center to fit the book. The face side has 1/48th scale line drawing of a 6-view of a Fw-190A-8/R8. The reverse side has a 4-view of a Fw-190A-3 and a side and bottom view of a Fw-190A3/U4. I want to thank Casemate Publisher for sending me this review sample and the folks at Kagero.